This golden coin is worth one Big Mac at any McDonald's location in the world. 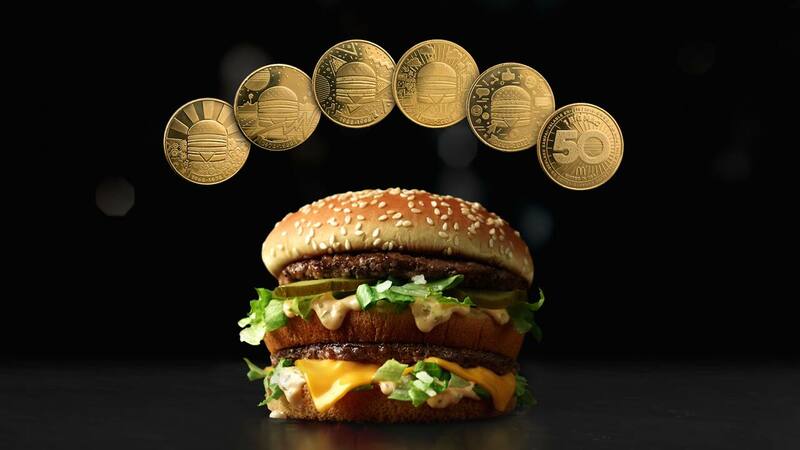 Starting August 2, McDonald's is offering a special "MacCoin" that can be redeemed for a free Big Mac between August 3rd and December 31st, 2018, at any McDonald's in the world. The coin comes free with the purchase of a Big Mac, but you are only allowed one coin per person per visit. Slickdealer deadbeefcafe notes that this deal also stacks with the $1 premium sandwich promotion available through the Mcdonald's app. Want premium Mcdonald's sandwiches for dollar menu prices? Here's how to get a Big Mac for just $1. Combining the two deals is a no-brainer, as you can get a total of two Big Macs for 50 cents each. That's pretty cheap, even by McDonald's standards. Because the $1 premium sandwich coupon is only good for one use per day, and the MacCoin is in limited supply, it makes sense to try and use the deal as often as you can (or as often as your arteries can take). The cost of acquiring a MacCoin is $4.59 (you have to buy a Big Mac), so the best outcome of your two-for-one sandwich attempt is $2.30 for each Big Mac. That's worse than if you used the daily $1 premium sandwich coupon. With that being said, Slickdealer puffcorn221 points out that there are five unique MacCoins being released, making them a collectible item for those interested in the hobby. It's doubtful that they will ever have any real value, but who knows. Maybe MacCoin becomes the new Bitcoin, and our future children will be swimming in Bic Macs for eons to come. Want more Mcdonald's hacks? Learn how to score an Extra Value Meal for $2 every Friday. Update 8/2/2018: We previously stated that the McCoin was being offered today only, which was incorrect. You can being collecting the McCoin on 8/2, while supplies last.